Isthmic spondylolisthesis (slipped vertebra due to a fracture) is a problem that typically occurs with a fracture in the bone that connects the upper and the lower facets, the pars interarticularis (Latin for “area between the joints”). The break normally occurs because of a stress fracture. This bony area when under stress from athletic activity in extension doesn’t have the chance to heal between stressful episodes. Eventually, the stress is greater than the bone can resist and the area fractures. Since this area of the bone is very poorly supplied with blood, healing is impaired and the fracture is quite commonly permanent. The most common area for this to occur is L5-S1. These fractures occur in about one of every 20 adolescents. Normally, the age when this break occurs is quite young- about eight to fifteen years. This defect is more common in athletes that participate in sports that require bending backwards (extension) such as gymnastics, diving, volleyball and football (linebackers). Genetics probably plays a substantial role as 50% of the Inuits (Eskimos) have this fracture. The fracture almost always starts in children and adolescents. Symptoms that occur when the pars first starts to break varies widely. Some kids actually don’t have much pain but only stiffness. If pain does develop, many adolescents will ignore it or won’t report it to their parents. Be suspicious of any child that has back pain as to not miss an acute fracture. If these young patients are identified early, they have a chance to heal in a brace. The unfortunate hallmark symptoms of isthmic spondylolisthesis is its variability. As the body tries to heal the fracture, it lays down a number of types of tissues including fibrous tissue, cartilage and bone. Free nerve endings grow into this mass. This total compilation of bone, cartilage, nerve and fibrous tissue is called the pannus. This pannus is not as strong as the original pars but can be quite tough and resist tearing for many years. This is why many patients with a spondylolysthesis have no knowledge of this defect and no pain unless the pannus tears. However, if an abnormally heavy weight or just the right aberrant load stresses the pannus as in a lifting maneuver, the pannus can tear and then become painful. Lower back pain develops. These patients develop symptoms with extension as bending backwards loads the inflamed pannus. Some even have pain with flexion as this may stretch the pannus. As you can see, the patient history may become confusing when developing a diagnosis through the history alone. The pedicles where the fractures originally occur can grow spurs as all bony fractures do to attempt healing. These spurs can then become large enough to compress the local nerve roots (L5) and leg pain can eventually develop. Leg symptoms normally increase very slowly over time with pain being intermittent and inconsistent in the beginning. As the spur continues to develop and the nerve hole narrows, leg pain can develop into the majority complaint. The leg pain normally occurs with standing (extension) as this narrows the nerve exit hole and disappears with bending forward or sitting. The vertebral body can slip down the front of the sacrum since the fractured piece of bone is the “door stop” and the vertebra sits on the sacral slope facing downhill. The actual alignment of the spine can change depending upon the amount of slip since the entire spine follows the L5 vertebral slip. The vertebral slip is noted in “grades”. The sacrum is divided into 4 parts. The first 25% is grade I, from 25-50% is grade II, 50-75% is grade III, 75-100% is grade IV and if the vertebra slides off the sacrum into the pelvis, this is a grade V or spondyloptosis. Most spondylolysthesis are grade I or II. The higher grades cause significant deformity with the pelvis and upper spine compensating for the slip. (Click to Enlarge Image) This is a CT scan of the side view of the lumbar spine in a patient with isthmic spondylolisthesis. The black arrow points to an intact pars (the bony area that connects the upper and lower facets). The white arrow points to the fracture and separation of the upper and lower facets. (Click to Enlarge Image) This picture illustrates an isthmic spondylolisthesis. The break in the bony pars is demonstrated by the stippled area (arrow) and the nerve root is seen exiting without compression. (Click to Enlarge Image) This picture illustrates an isthmic spondylolisthesis with a bone spur compressing the exiting nerve. 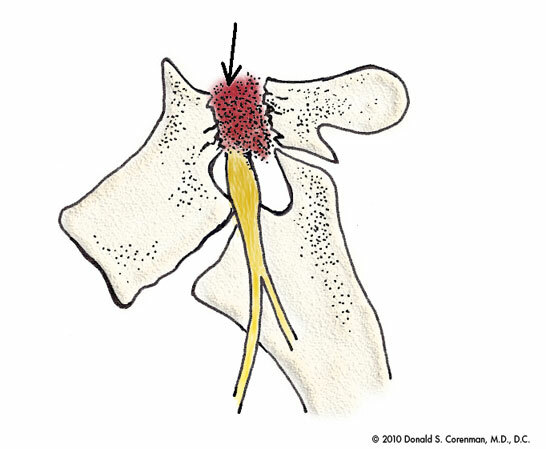 The break in the bony pars is demonstrated by the stippled area and the nerve root is seen being compressed by the bone spur (arrow). (Click to Enlarge Image) CT scan of patient with a pars fracture of L4. (Click to Enlarge Image) CT scan of a patient with pars fractures at L5 and L3. (Click to Enlarge Image) Axial CT image of bilateral pars fractures of L5 (arrows). Are you suffering from symptoms of Isthmic Spondylolisthesis? The typical surgery for this disorder is a TLIF but for severe grades, a front and back surgery may be necessary. For more information on isthmic spondylolisthesis, or to discuss treatment options of a slipped vertebra due to a fracture with a back doctor and spine specialist in the Vail, Aspen, Denver and Grand Junction, Colorado area, please contact Dr. Donald Corenman.